Motorola's Droid has been the subject of much discussion lately, fueled in part by a series of controversial TV ads. 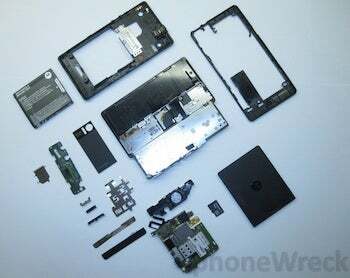 So it was only a matter of time before someone decided to take the Android-powered device apart, revealing the innards of the highly anticipated sliding smartphone. The teardown comes courtesy of PhoneWreck, who posted a series of photos of the new phone being completely disassembled. The teardown team is now in the process of identifying all of the phone's components, including the chips found on the Droid's logic board, with updates being pushed out on their site and Twitter account. PhoneWreck describes the teardown process as delicate and difficult, however they detail that the phone's sliding mechanism was surprisingly simple. For a closer look at what the Droid looks like when not in pieces, be sure to check out our visual guide to Motorola's latest offering.